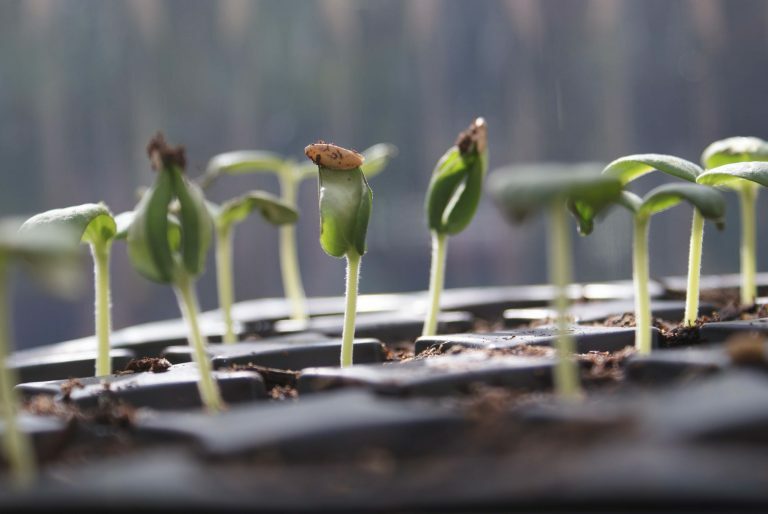 Get ready, get set, get started planting those seeds that have been carefully hand-selected from a seed catalog, over the long winter months, or meticulously saved from last year’s harvest. All farmers—urban, suburban, and rural—are in high gear this time of year, taking stock of seed supplies, prepping soils, and planting in hopes for a successful harvest. Maximizing a spring, summer, or fall harvest always starts with high-quality seeds. 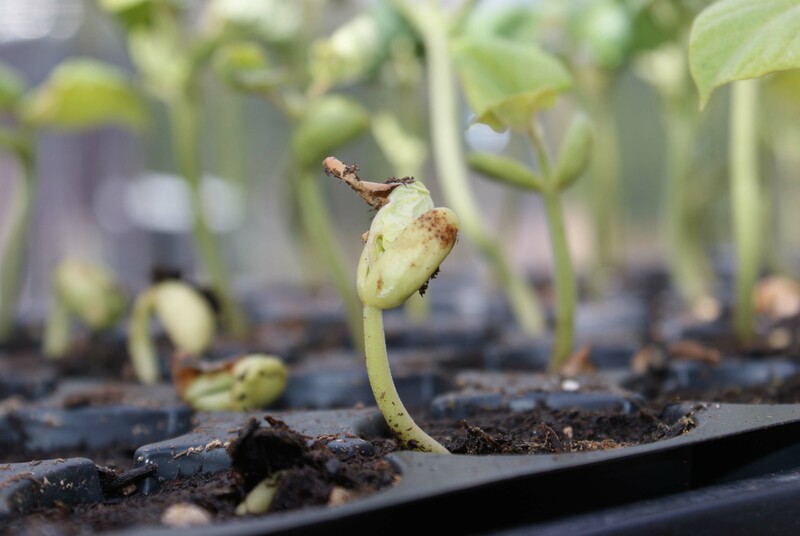 The seed and initial planting processes help determine the health of plants and their yields. Will they survive the devastating affects that harsh weather and disease can have on a plant? Start by purchasing hardy heritage and/or organic seeds, if possible, and pay close attention to the planting instructions on the back of a seed packet. All seeds sprout and grow at different rates, so timing is very important. Your last spring frost date determines how many weeks before planting you should sow. Some seeds can be directly sown right into the ground, such as carrots, radishes, beets, and beans. Others, like tomatoes, melons, and squash are sown indoors first to get a head start and then transplanted. 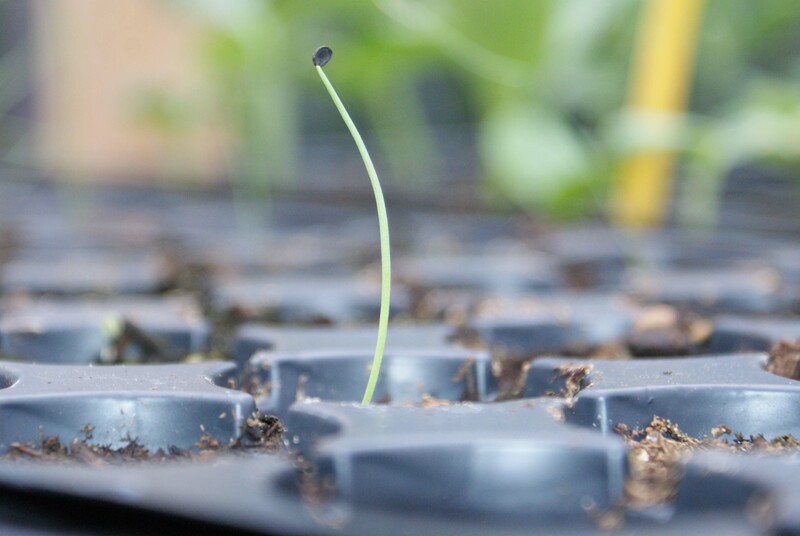 Growing plants from seed is not only less expensive, but gives anyone the great satisfaction of being a part of something miraculous, much like a first time parent seeing their baby grow tall, strong, and healthy. How Do Our Babies Grow? Living in the Pacific Northwest makes for a shorter growing season. This means we take advantage of hoop houses, greenhouses and indoor south facing windows to jump start our seeds. Always consider your climate and growing cycles when planting and never be afraid to experiment and try something new. We are trying eggplant this year, which is typically a southern climate crop. According to the OSU Master Gardener Program, you should not expect more than 65 to 80 percent of seeds to germinate. Our success rates fell into this estimation. Take a look for yourself. Our cantaloupe and watermelon (above) are off to a great start. Along with our Kentucky pole beans we saved from seed last year. 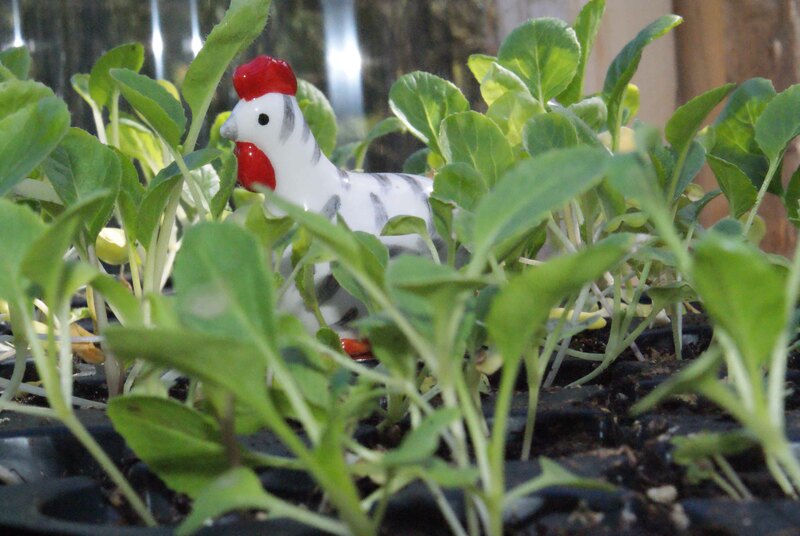 If this chicken was real, our baby bok choy would be eaten in an instant. There’s something truly beautiful about this lone ranger of an onion. 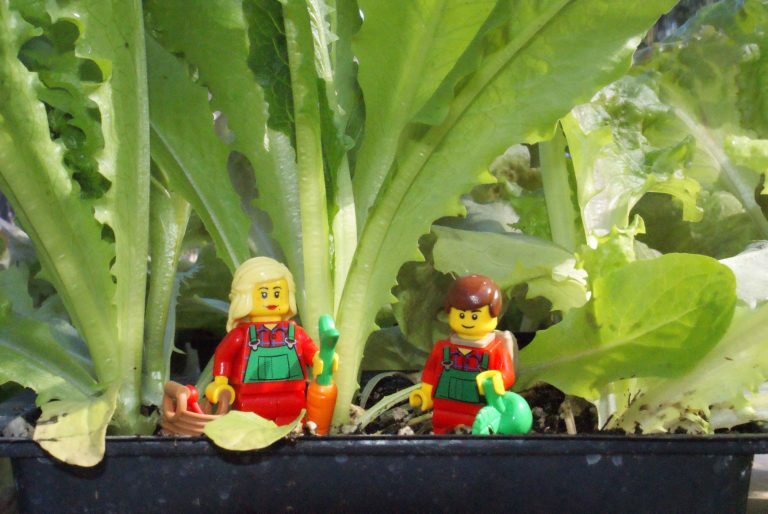 And our leaf lettuce has been growing tall, thanks to Farmer Robert, who loves watering our starts almost as much as his legos! There are four essential elements that affect a germinating seed: water, oxygen, light, and heat. A steady supply of water is needed to ensure germination. It’s important to keep the soil moist at all times, but not too wet so as to prevent rotting. Using a soil-less medium to plant your seed, that is loose and aerated, allows the proper oxygen flow. Most seeds need 14-16 hours of light daily. This can be provided and controlled under grow lights or a nice, sunny south-facing window. Without adequate light they will become tall and leggy. Temperature is another important factor in germination. Generally, 65-75 degrees is best for most plants. A good rule of thumb is to plant your seed two-three times its width under the soil, so all essential elements can have their proper effects. 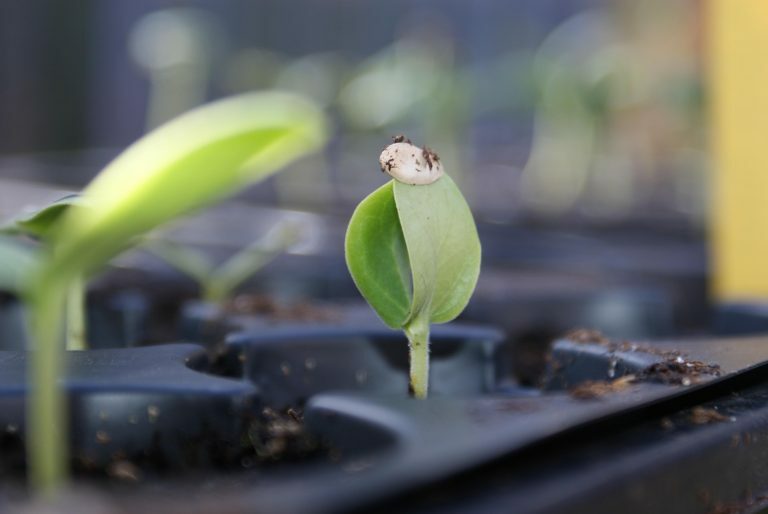 It is time to start feeding your seedlings once they develop their second set of true leaves. Fertilizing is critical to a successful growth rate. If you use synthetic fertilizer, use half the fertilizer required for a regular plant. You do not want to run the risk of over-fertilizing and burning them. A mix of fish emulsion and kelp is a gentle and organic way to go. You might need to thin your seedlings out or transplant them into larger pots. Transplanting can keep them from the elements a bit longer and ensure their strength. Tomato and pepper plants are great candidates and love being babied a bit longer. It’s best to gradually get your plants used to an unsheltered life outdoors. Exposing them several hours a day, for 7-10 days before planting, allows them time to get hardened off. Always remember to poke holes at the bottom of any container that you use to provide proper drainage. What seeds are you starting this spring? Are you inspired to plant your spring seeds this year? Leave us a comment below and let us know. We’d love to hear from you. We hope your harvests are grand! Next Post Have You Ever Met a Wild Dandelion?